First, find an empty area of your desktop and use your mouse's Right button to click in it. You should see the window to the right open up. 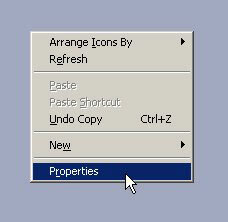 Next, bring your mouse arrow (cursor) to the word "Properties" and use your Left mouse button to click on it. Then you should see the Display Properties dialog box (window) open up (see image to the right, yours may look a little different). 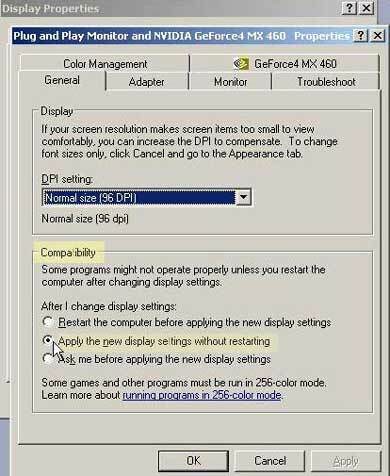 Click on the "Settings" tab, then bring your mouse arrow to the little tab under the words " Screen resolution" and if you see 800 by 600 or 640 by 480, drag it until the numbers under it say : 1024 by 768 pixels (again, see image to the right). IMPORTANT! If it already says 1024 by 768 pixels click Cancel, you are already at the correct screen size for this web site and probably do a lot less scrolling when you visit web pages. Good for you! 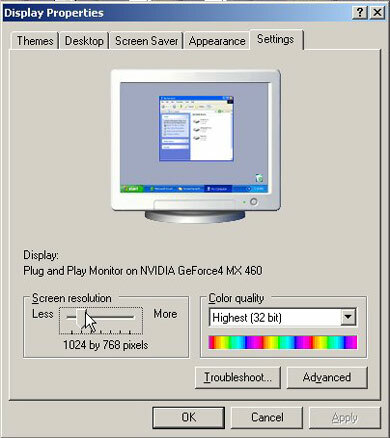 If you see 800 x 600 or 640 x 480, and have to move the little slider to change it to 1024 by 768 pixels, DO NOT CLICK OK yet. Instead, look for the rectangular button that says "Advanced" and click it and go to Step 3. On the bottom half of the window, you will probably see the word "Compatibility". Look for the three options to choose from after the words "After I change display settings:" (see image to the right). If it isn't already selected, click on the one that says: "Apply the new display (Win 98 may say color) settings without restarting", then click "Apply" then "OK". The window will close and you will again see the previous window, click OK again. Your screen may go black for a moment, and then it will come back at the new size. You may need to bring your cursor to the bottom right corner of your browser window, then hold down the left mouse button and drag it to fill the screen. That's it! If you are using Mac Classic, there is a tab somewhere on the left border of your screen. Open it and select the color television screen icon. Select the screen resolution you would like from the pop-up options that appear.